Bunka Gakuen Costume Museum is affiliated with Bunka Gakuen Educational Foundation and is a specialized garment museum of which there are few in Japan. Bunka Gakuen was established in 1923 and comprises of Bunka Gakuen University, Bunka Fashion College, Bunka Fashion Graduate University, Bunka Fashion Research Institute, a library, museum, and publishing bureau. As a general fashion education institution it is central to fashion education in Japan and produces a large number of graduates for the fashion industry. When Bunka Gakuen was established there was a plan to create a specialist apparel museum for research and education purposes based on original, high quality items. 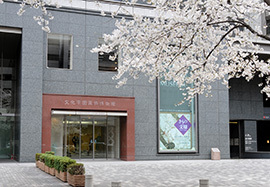 Bunka Gakuen Costume Museum was opened in 1979 and in commemoration of Bunka Gakuen’s 80th anniversary in 2003 it moved to its present location in the Shinjuku Quint Building which is located along Koshu main road. Bunka Gakuen Costume Museum is a specialist university-affiliated museum that specializes in clothing – a fundamental element of everyday life. It is our hope that the museum’s garments which have been collected for academic purposes will be made available to the general public and contribute towards the promotion of knowledge. Bunka Gakuen Costume Museum holds four exhibitions each year on the theme: “Understanding the Culture of the World and Japan through Clothing”. Each exhibition displays a variety of cultures through garments in an easy to understand manner. The museum continues to improve its garment collection and exhibitions and also strives to deepen people’s understanding through gallery talks, lectures and exhibition pamphlets. The museum conducts research and exhibitions with other museums and art galleries in Japan and abroad, and also provides information which can be of use to the wider society. The collection at Bunka Gakuen Costume Museum consists of items that were obtained by its affiliate organization – Bunka Gakuen (established in 1923) – with the intention of enriching education on the westernization of clothing. Initially, the collection mainly consisted of European dresses, early Japanese western style clothing, and kimonos. After the Second World War, the museum received garments from East and South East Asia which were obtained before the war by an organization affiliated with the Japanese army. This formed the basis of the museum’s traditional ethnic clothing collection. From 1970s-1990s the museum actively sought to expand its collection to include garments from a variety of different regions. Today, the museum seeks to create a comprehensive and systematic collection which includes garments from a variety of regions including Japan, Asia, Europe, Africa, and Latin America. Closed: Sundays, National Holidays, Year End & New Year, Holidays, Summer Holidays, Occasionally for changing displays. * Handicapped visitors and one person accompanying them are free of charge. 7 minute walk from Shinjuku Station South Exit (JR, Odakyu, and Keio Lines) . 4 minute walk from Shinjuku Station No.6 Exit (Toei Shinjuku and Oedo Lines) . Next to the underground passage “One day Street” O-1 Exit. Copylight ©2013 BUNKA GAKUEN COSYUME MUSEUM. All right reserved.